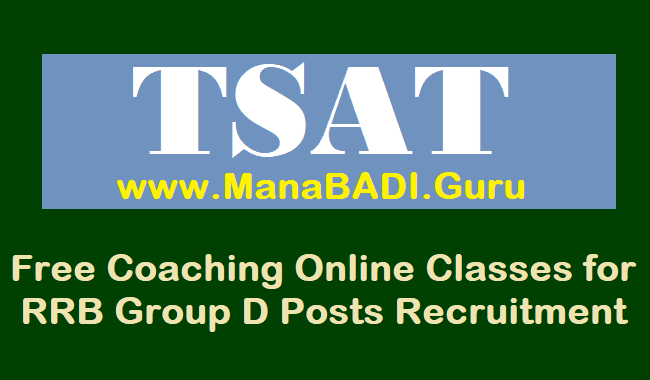 TSAT RRB Group D Posts Recruitment 2018 Free Coaching Online Classes Starts from 2nd April, T SAT Free Coaching Online Classes for RRB Group D Posts Recruitment 2018: T SAT Video Classes, 45 Days T SAT Free Coaching classes for RRB Group D Posts Recruitment 2018, T SAT Live Recorded Coaching Classes for RRB Recruitment, Telangana’s T-SAT to telecast free coaching classes for RRB Group D Posts Recruitment Test: Mana TV Online video Classes for RRB Group D Posts Recruitment, T SAT Nipuna MANA TV live coaching classes for RRB Group D Posts Recruitment, TS SAT Mana TV Training Programmes, SoFTNET MANA TV Channels Telecast schedule for RRB Group D Posts UDYOGA GUIDE: Udyoga Guide, MANA TV RRB Group D Posts Recruitment Training Classes, T SAT MANA TV Live Classes for RRB Group D Posts Recruitment. RRB Group D Posts Recruitment Udyoga Guide would be telecast daily from 02-04-2018 by 45 days. T SAT Mana TV to telecast Online video Coaching classes as RRB Group D Posts Recruitment exams from April 2. The Telangana State-run education channel, Mana TV will telecast coaching classes for RRB Group D Posts Recruitment examinations to help students from rural and financially backward families. Appearing for the RRB Recruitment Exam ?.. Then these training classes on the T-SAT Nipuna can help you in cracking the RRB recruitment test. Starting April 2, Society for Telangana State Network (SoFTNET), which operates T-SAT Nipuna channel under Department of Information Technology, Electronics and Communication, will telecast "RRB Udyoga Guide', a training programme for candidates aspiring to become a Employee in RRB . The subject-wise audio-visual content will be telecasted on on T-SAT Nipuna and the same content will be repeated next day on T-SAT Vidya.